Glory and Splendor of the age of Royal Baroque music is celebrated in this album by the Cologne New Philharmonic Orchestra conducted by Volker Hartung. 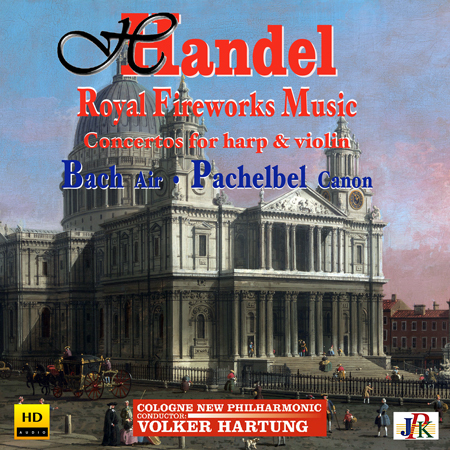 It was composed in 1748 for a fireworks display inspired by political events. The British King George II wanted a huge celebration with great fireworks and music on occasion of the Aachen peace treaty in October 1748. The splendid and delightful Harp Concerto in B major is an original work by Handel and one of his most beautiful works, brilliantly performed by great German harpist Konstanze Jarczyk. Conductor Volker Hartung takes his violin as soloist in this passionate reading ofJ.S. Bach's Violin Concerto no.1 in A minor. Johann Pachelbel’s famous Canon, the „Air“ from Bachs 3rd Overture Orchestra as well as a highly virtuoso performance of the „Badinerie“ by flutist Michael Schubert are concluding this beautiful album. Ludwig van Beethoven was perhaps the first self-certain individual in modern times and his work the musical embodiment and fulfilment of political revolution. Beethoven began his composing career with the creation of chamber works. His Septet Op 20 in E flat Major op. 20 for Clarinet, Horn, Bassoon, Violin, Viola, Cello and Double Bass was an instant great success in Vienna of 1799 and became one of the most popular works of Beethoven, witnessed numerous editions soon as well as arrangements for different instruments by the composer himself. Conductor Volker Hartung thought to get a better dynamic balance between the strong wind instruments and the few strings in expanding this section. He uses the full string section of the orchestra, without changing the composition. 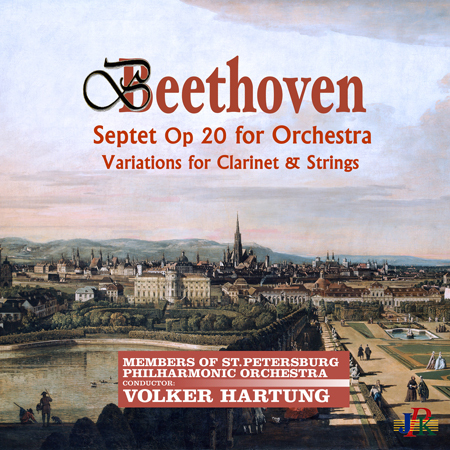 On this album Maestro Hartung and the musicians from the Saint Petersburg Academic Philharmonic Orchestra are performing with 10 Violins, 5 Violas, 5 Celli and 3 Double Basses for their new recording of Beethoven's masterpiece with the advantages of modern high-end sound recording technologies in 24bit/48kHz HD-Audio. During a journey to Prague Beethoven wrote four pieces for Mandolin and Piano for Comtesse Josephine von Clary-Aldringen, a well-known singer and mandolin player. Miltos Mumulides, principal Clarinetist of the Cologne New Philharmonic, arranged the present version for clarinet and string orchestra. It keeps closely to the original and is written in the original key. The elegant work is a shining little jewel, full of humor, with deep emotions in the minor variation ideally suited for the register of the clarinet and brilliantly performed soloist and orchestra!